Heeft u een vraag voor Surfaris Inn? Tijdens uw bezoek aan Bali zult u zich snel thuisvoelen in Surfaris Inn, dankzij de hoge kwaliteit en de goede service. Het levendige stadscentrum is slechts 7.8 km verwijderd. Een baken van rust en ontspanning: deze accommodatie biedt totale vernieuwing op een steenworp afstand van bezienswaardigheden zoals Bali Bom Herdenking, Aus Bali Experience - Day Tours, Ground Zero Monument. Surfaris Inn biedt vele voorzieningen om uw verblijf in Bali zo aangenaam mogelijk te maken. Voor het comfort en gemak van haar gasten biedt de accommodatie gratis wi-fi in alle kamers, 24-uur beveiliging, 24-uur receptie, wi-fi in openbare ruimtes, parkeerplaats. Alle accommodaties beschikken over goeddoordachte voorzieningen om een ongeëvenaard gevoel van comfort te garanderen. De accommodatie biedt talrijke recreatieve mogelijkheden, zodat u voldoende te doen heeft tijdens uw verblijf . Surfaris Inn is een slimme keuze voor mensen die naar Bali reizen, een ontspannen verblijf is gegarandeerd. I enjoyed my stay although I didn't spend much time in Legian. I arrived around 8pm and the place was dead. I had to wait a bit to find someone to check me in. Took me up to a very pleasant room. It had a fan, AC, a comfy bed and a couple tables and a closet. The bathroom was fine and also had hot water. I don't care much for the decor, but the room was modestly decorated too which I thought was welcoming. I wanted to rent a motorbike to travel to Ubud and a couple other places. I asked the staff and the night guy didn't know. But when I woke up, the morning guy knew someone and she arrived within an hour. It was perfect. 60k rupiah for the day. I got it for 2 days and traveled to Ubud, Ulu Watu and Tanah Lot. The final day, I walked around, went to Kuta beach and shopped a bit. They let me keep my bag there as my flight didn't leave till late at night. They spoke enough english and the morning guy was actually quite good at english and very helpful. The negatives would have been that the Wi-fi was super limited to if you were in the common area. The pool was lovely, but I never used it because it was kind of in an odd location. The breakfast was odd as well. They didn't really have a lot of options. The Jaffle was very good though and they had some fruit and tea. I liked it because it wasn't on the main track and it wasn't loud. But, if you have a map or GPS, you can find a kind of secret allyway to get to legian raya where there are lots of loud bars and clubs and the beach is about a 15 min walk away. I'd definitely recommend this place. If you just want to relax, it works. If you want to party a bit, it works as well. It works if you want a little of both. 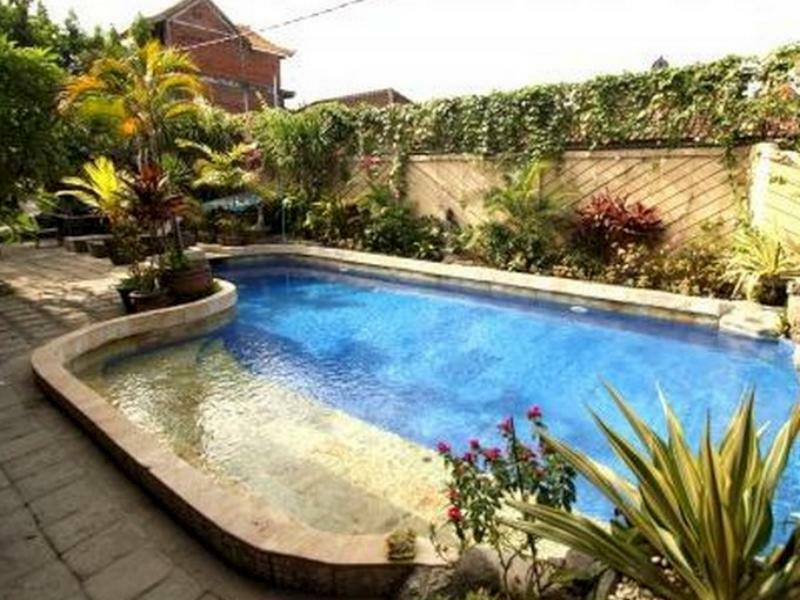 It also is a decent place to stay if you want to travel around a bit around Bali via motorbike. Better if the pool had some shade but overall this was a nice hotel, with good service and right on the beach. Internet good too. Quiet place, simple but with anything you need. Close to the Main Street, good included breakfast , security 24 h!